The Darwin Symphony Orchestra based at Charles Darwin University has won the prestigious Australia Business Arts Foundation Partnership of the Year award. The award recognises the partnership between DSO and Sitzler, and their production of the 2011 Sitzler Red Desert Tour to Alice Springs. 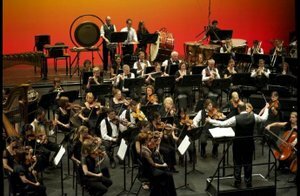 The tour showcased several musical performances and community workshops over five days in September, including Symphony Under the Stars at the Alice Springs Desert Park. Minister for Arts and Museums, Matt Conlan congratulated the DSO on the 20 year ongoing partnership that has enabled the DSO to perform various productions in communities across the Territory. “These productions are possible with the fantastic work of the 70 volunteer musicians of the DSO and the beneficial partnership with Territory construction company, Sitzler,” Mr Conlan said. “These partnerships are important to developing arts in the Northern Territory and I commend any private business entering into similar initiatives.